The New Guide (by Percent) command adds a guide to the image. The position of the guide is specified as a percentage of the canvas Height and Width. You can add guides to the image more quickly by simply clicking and dragging guides from the image rulers and positioning them where you would like. Guides you draw with click-and-drag are not as precisely positioned as those you draw with this command, however. You can access this command from the image menubar through Image → Guides → New Guide (by Percent). 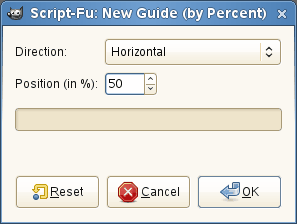 When you select this menu item, a dialog opens, which allows you to set the Direction and Position, by percent, of the new guide. You can choose the Direction of the guide, either Horizontal or Vertical, by using the drop-down list. You can also choose the Position of the new guide. The coordinate origin is in the upper left corner of the canvas.